How will you get growth in 2018? This year we have been very busy developing the latest version of our sales excellence diagnostic, (Version 10). Based on user feedback, we’ve included some very useful new features. To celebrate, we’d like to give one lucky organisation the opportunity for a free diagnostic report for their sales organisation. Version 10 incorporates a simpler model of sales organisation performance, broken down into 10 key areas. This model has evolved over 8 years incorporating well over 1000 inputs of research, evidence based practitioner input and client project reviews. As in versions 8 and 9, there are 3 versions of the sales diagnostic, so you can contrast how managers think their organisation functions, compared with the views of sales people on the ground. We also have a short version for customers to complete to incorporate the all important voice of the customer in the diagnostic. Over the last 3 to 4 years, there have been some very interesting developments in the field to increase face to face sales time, and accelerate / improve sales & marketing collaboration. 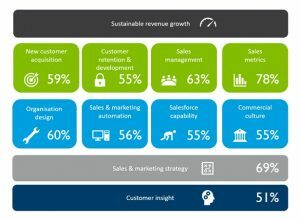 Of course, sales force automation (SFA) and marketing automation is rapidly evolving, and version 10 ensures you assess your organisation in these areas. We can now produce your customised sales excellence diagnostic in a much faster time frame, typically within 48 hours of closing off the on-line survey to your staff. How do I become the lucky organisation then? From your side, we ask that you participate in the process of communicating the survey to your sales team and set aside 2 hours once the report is completed so that we can help you get the most from it. Contact helen.wilcox@sellinginteractions.com if you would like to be the lucky organisation that wins the free sales diagnostic. The first organisation to respond that meets the criteria above will be the winner. We will publish the winner on our website & via Linked-in by 31st December 2017.